Google, one of the largest and richest companies on the planet, thanks to its internet and technology business, has decided that the outsides of its data centers are boring. So the company has decided to hire artists to put murals on the walls of these centers to not only make them aesthetically pleasing but to create curiosity about the work that is going on inside. Thus far, two data centers, in Oklahoma and Belgium, display murals. Two more, in Dublin, Ireland and Council Bluffs, Iowa, are slated for the artistic upgrade. Google plans for 11 other data centers across the world to be decorated with murals. In Mayes County, Oklahoma, an artist named Jenny Odell decided to take her inspiration from Google Maps. She resides in the San Francisco Bay Area and thus grew up around technology centered on Silicon Valley. Images in her mural include swimming pools, salt ponds, circular farms, and wastewater treatment plants. Odell is interested in bridging the digital world and the visual, thereby creating curiosity in people who view her art and making them gain a new perspective of the physical world. Oli-B created the mural that now graces the outside walls of the Google data center in St. Ghislain, Belgium. Oli-B’s approach is to combine images from inside the data center–objects, animals, and people–with those from the surrounding town. The mural’s images are incorporated in clouds, a metaphor for “the cloud,” in which an entire universe has been created digitally. Oli-B works in a variety of media, including acrylic, spray paint, digital, and screen printing. He uses a variety of surfaces, including paper, canvas, wood, walls and even stickers. He started as a graffiti artist in his teenage years before turning respectable, though he has not quite broken away from his street artist roots. Oli-B’s work tends to be in bright, appealing colors that catch the eye, His work can be seen on various walls, posters, and even articles of clothing in Belgium and elsewhere in Europe. In the modern age, as it was during the Renaissance, corporations and rich benefactors are increasingly becoming patrons of the arts. Office buildings, hotels, and other structures are enhanced when they are decorated with paintings, sculptures, murals, and other appealing objects. Whether one is a merchant prince in 15th century Florence or a dot.com entrepreneur in 21st century Silicon Valley, patronizing the arts brings prestige. 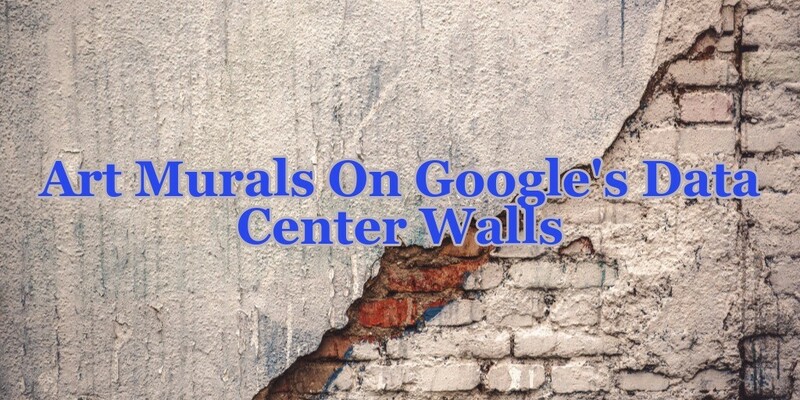 Google believes that the murals being created on the walls of its data centers will serve as attention-getting devices, drawing the eye to what would otherwise be drab, boring structures. The company believes that what goes on inside these data centers is of great interest and significance. The idea is that the buildings themselves should reflect that fact. In any case, we can look forward with interest to what the data centers in Dublin and Council Bluffs will look like once the artists hired to create murals get through with them.